No restriction approval means OceanSaver is now able to offer peace of mind to ship owners by offering a BWTS in full compliance with both US Coast Guard and IMO standards. Ideal for uninterrupted Trade or Cargo Ops. As the ? rst electrochlorination ballast water treatment system to obtain ? nal USCG type approval certi? 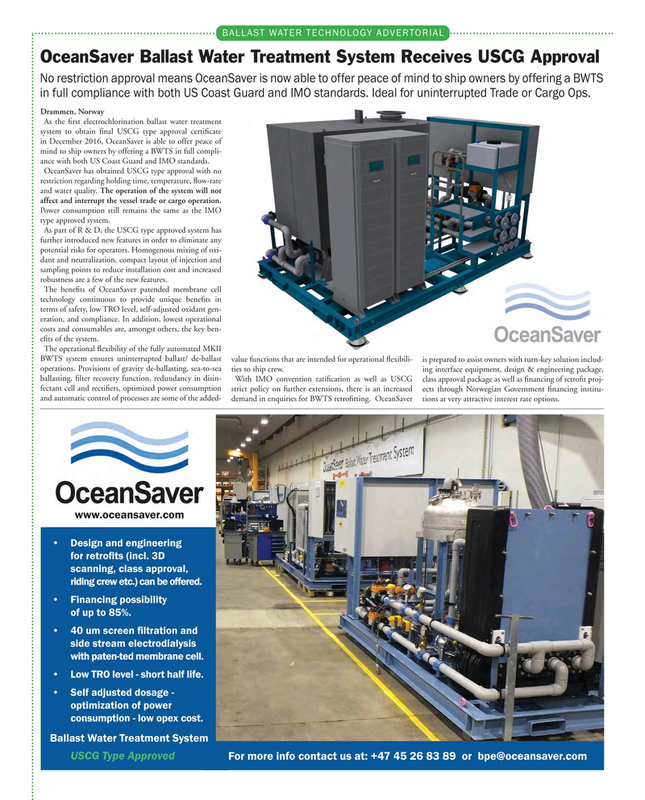 cate in December 2016, OceanSaver is able to offer peace of mind to ship owners by offering a BWTS in full compli- ance with both US Coast Guard and IMO standards. OceanSaver has obtained USCG type approval with no restriction regarding holding time, temperature, ? ow-rate and water quality. The operation of the system will not affect and interrupt the vessel trade or cargo operation. Power consumption still remains the same as the IMO type approved system. As part of R & D, the USCG type approved system has further introduced new features in order to eliminate any potential risks for operators. Homogenous mixing of oxi- dant and neutralization, compact layout of injection and sampling points to reduce installation cost and increased robustness are a few of the new features. The bene? ts of OceanSaver patended membrane cell technology continuous to provide unique bene? ts in terms of safety, low TRO level, self-adjusted oxidant gen- eration, and compliance. In addition, lowest operational costs and consumables are, amongst others, the key ben- e? ts of the system. BWTS system ensures uninterrupted ballast/ de-ballast value functions that are intended for operational ? exibili- is prepared to assist owners with turn-key solution includ- operations. Provisions of gravity de-ballasting, sea-to-sea ties to ship crew. ing interface equipment, design & engineering package, ballasting, ? lter recovery function, redundancy in disin- With IMO convention rati? cation as well as USCG class approval package as well as ? nancing of retro? t proj- fectant cell and recti? ers, optimized power consumption strict policy on further extensions, there is an increased ects through Norwegian Government ? nancing institu- and automatic control of processes are some of the added- demand in enquiries for BWTS retro? tting. OceanSaver tions at very attractive interest rate options.